In advance of the market launch of the highly anticipated next generation Acura NSX, the engineers leading the supercar’s development shared new technical details and design strategies with the automotive engineering community at the April 22nd SAE Detroit Section dinner, held in conjunction with the SAE 2015 World Congress and Exhibition. Additional information about the team’s efforts to achieve a true “New Sports Experience” included details of the NSX’s world’s first body construction process that helped create a multi-material space frame resulting in class-leading body rigidity, the advanced total airflow management system and an update on NSX’s power unit specifications. Ted Klaus, chief engineer and global development leader of the new NSX, introduced key powertrain, body and dynamic performance engineers who shared new product and technical details in their related areas of the development. The unprecedented sharing of technical details prior to the car’s market introduction reflects the desire of the NSX development team and the company to inspire the imagination of automotive and technology enthusiasts along with the next generation of engineers. The NSX includes Acura’s first use of a revolutionary multi-material space frame design that delivers class-leading body rigidity while remaining lightweight. World’s first automotive application of new ablation casting1 technology resulting in world-class body rigidity for ultimate handling and control. World’s first use of a three-dimensionally formed, ultra-high-strength steel A-pillar, supporting class-leading rigidity and crash performance while providing outstanding outward visibility. The NSX achieves top-in-class aerodynamics targets without the use of active aerodynamic elements, while its three-motor Sport Hybrid power unit is cooled through 10 heat exchangers all thanks to a total airflow management strategy that maximizes the flow of air around and through NSX. Displacement of the NSX’s all-new twin turbo V-6 engine was confirmed to be 3.5-liters. The NSX will mark the introduction of the most capable and highest torque capacity Super Handling All-Wheel Drive system in Acura history. The latest proprietary logic advances Acura’s two decades-long pursuit of Super Handling that proactively responds to driver inputs, allowing the NSX to achieve a new level of line trace while at the same time intelligently supporting the driver in changing environments. At the core of the NSX mission to deliver timeless sports car values is an aluminum-intensive, multi-material space frame. 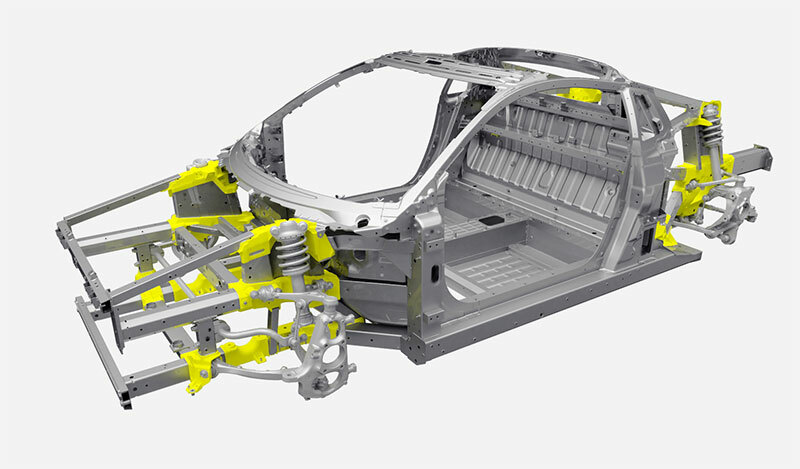 This innovative space frame represents a next-generation leap in body design with class-leading technology that is exclusive to Acura within the automotive market. 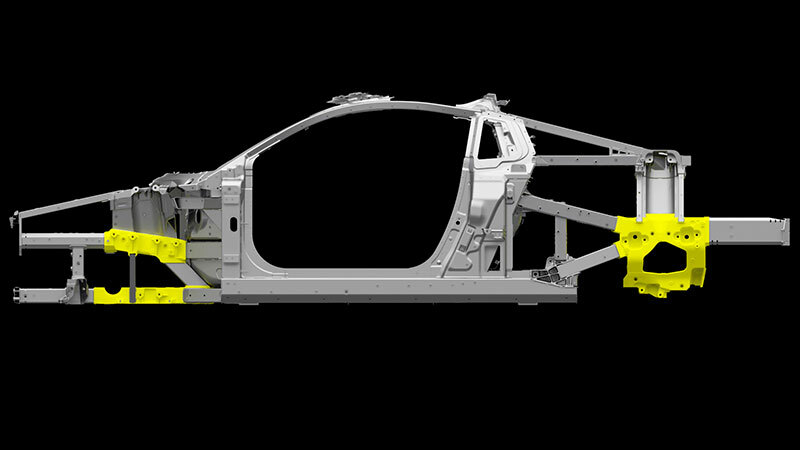 Based on internal data, the all-new Acura NSX multi-material body is by far the most rigid in its competitive set. While the all-aluminum monocoque body of the original NSX was ahead of its time, current aluminum and ultra-high-strength steel-intensive body architecture has been taken to the limit for supercar design. A key advancement in casting technology allowed the NSX development team to realize a quantum leap in body design, for the first time being able to engineer a vehicle with castings in key locations for rigidity, that also support the ductility necessary for placement within crush zones. The Acura NSX heralds the world’s first application of ablation casting technology in the automotive industry. Ablation casting combines traditional casting methods with rapid cooling techniques to offer the design flexibility and rigidity of casting with the ductility and energy absorption characteristics of extruded material. Traditional castings provide the ultimate rigidity in space frame and other body designs, but have traditionally suffered a major drawback: traditional castings are brittle. With the no-compromise performance goals of the NSX, a groundbreaking new casting method within the crush zones had to be used. The ablation process allows the ultra-rigid castings to be located within the crush zones and to function as large aluminum nodes, or junction points. Aluminum extrusions are then inserted into sockets in the ablation cast nodes, which act as fixtures that hold the space frame in place during welding. During the welding process, shorter stitch welds can be applied, enhancing the exceptional, repeatable precision of the NSX space frame construction by reducing heat deformation during the production process. Ablation castings also enable traditional aluminum castings to be used at strategic locations in the space frame and as the primary mounting points for suspension and power unit components, in addition to being the reference and temporary attachment points during the highly accurate space frame construction process. Full space frame construction and vehicle assembly are conducted on-site at the new Performance Manufacturing Center (PMC) in Marysville, OH, providing a high level of quality control. In addition to the world’s first casting technology, the NSX applies an all-new three-dimensionally formed ultra-high-strength steel A-pillar that provides next-generation rigidity and precise shape specification tolerances. The previous generation NSX had a thin A-pillar that provided very good outward visibility. Reflecting this heritage with modern rigidity and roof crush performance requirements demanded this new, ultra-high-strength production method. NSX represents an advanced expression of modern body design theory: the strategic integration of multiple materials to achieve optimal body performance for numerous targets, including rigidity, dynamic response, superior fit-and-finish and occupant protection. The aluminum-intensive space frame is complimented with precisely crafted ultra-high-strength steel and anchored with a carbon fiber floor together producing body performance at its peak. For the new NSX, the body design and technologies are about more than just raw performance – a goal of any supercar development. In keeping with the human-centered supercar concept, the NSX development team went further, to optimize how the car’s performance capabilities are experienced by the driver through the body. Drivers will experience all of the on-the-rails handling provided by the Sport Hybrid SH-AWD power unit because it is communicated in high-fidelity through the most rigid body in its class. To meet the challenge of the ambitious performance targets, radical packaging design and exotic styling for the next generation Acura NSX, the development team had to totally re-imagine the thermal and aerodynamic engineering for this modern supercar so that maximum energy is extracted from the flow of air around and through the NSX with the highest efficiency. This new total airflow management strategy supports component cooling, aerodynamic performance (drag and downforce) at a very high level without the use of active aero technology, while also contributing to even more dynamic styling. Computational fluid dynamics (CFD) was used extensively during development to allow the U.S.-based development team to maximize the performance of a power unit being developed in Japan. CFD models were run on computers totaling many years’ worth of computational uptime. Thermal CFD was effectively used in two ways during development: first, for the proof-of-concept in establishing heat management strategy at the earliest development stage and second, for continuous thermal performance improvement as the vehicle matured through development. Extensive involvement of thermal CFD with design engineers during the development enabled maximum design optimization. Along with the use of advanced CFD, wind tunnel and real world testing, the development team also employed computerized lap-time simulation models of some of the world’s most legendary proving grounds that could then be run on chassis-dynamometers allowing testing and validation of computer models for thermal management. The all-new NSX employs 10 air-cooled heat exchangers responsible for cooling the front twin-motor unit (TMU), twin-turbo V6 engine, rear direct-drive electric motor and 9-speed dual clutch transmission (DCT). The all new, twin-turbocharged 3.5-liter V6 engine at the heart of the Sport Hybrid SH-AWD power unit requires the greatest cooling and receives it through three radiators: one center and two side units to get maximum airflow volume and efficiency. 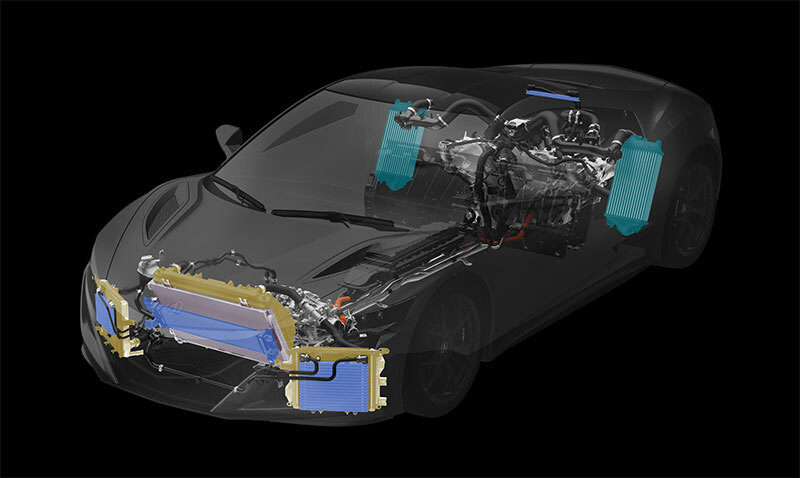 The center radiator is tilted forward 25-degress, allowing the largest, optimized configuration that best utilizes the inherent pressure gradient while maintaining the strict low center of gravity targets of the NSX’s Advance Sports Package. Condenser and power drive unit (PDU) coolers are efficiently packaged in front of the center engine radiator. The TMU is cooled passively through strategic use of air in the front motor room and by a heat exchanger mounted in front of the right engine sub-radiator. The 9-speed DCT is cooled by two heat exchangers, one mounted in front of the left engine sub-radiator and the other in the engine compartment. Twin-intercoolers located in the signature side intakes are used to cool the intake air charge. NSX achieves top-class aerodynamic balance and supercar aerodynamic downforce without the use of active aero. Aerodynamic drag is minimized, even while moving large airflows through NSX as it inhales and exhales. Aerodynamic downforce is created through the total airflow management focus on utilizing airflow through each vent, as NSX exhales, and through more traditional aerodynamic shape optimization. NSX has undergone extensive testing at the company’s state-of-the-art wind tunnel in Raymond, Ohio, using ultra-detailed 40-percent-scale models that replicate all of the intake and exhaust vents, heat exchangers and major under-hood components. These highly accurate scale models replicate drag and lift performance with near perfect approximation. It has been verified and put through its paces at the company’s full-scale wind tunnel in Japan, and on real and simulated proving grounds throughout the world. Total airflow management vents and precision ducting also help create strong, consistent downforce for NSX and were tuned to optimized forms with aerodynamicist and designer input during working wind tunnel sessions. Six vortices flow at the rear of the NSX including those that support creating the highest downforce across the rear deck lid. Flowing from below the car and exiting through meticulously optimized lower, rear diffuser fins is a critical vortex that further anchors NSX to the ground. Uniquely, the fins are not parallel to each other, but are narrower toward the front of the car and wider at the rear. This design creates low pressure and further maximizes downforce. The groundbreaking Sport Hybrid SH-AWD dynamic torque vectoring technology applied to this all-new NSX represents research and development that has been ongoing for well over two decades. Acura has been continuously refining its advanced torque vectoring technology while in parallel developing new ways of accomplishing the timeless sports car values of lightweight, rigid chassis and potent powerplants. This all-new Sport Hybrid SH-AWD represents a system injected with more electric power, delivered more directly, managing more internal combustion power than any system Acura has engineered to date. In keeping with the development team’s ‘human-centered supercar’ concept, the new NSX and its Sport Hybrid Super Handling drivetrain were truly engineered from the driver out. While the NSX provides a new sports experience with ‘on rails handling,’ its Super Handling technology was optimized to enhance the driving experience by responding instantaneously and intuitively to the will of the driver. Super Handling is brought to its pinnacle form in NSX where the strengths of electric motors –delivering zero delay acceleration – allows the NSX to offer dynamic torque vectoring even at low vehicle and engine speeds. Super Handling logic has progressed along a parallel path with hardware. While many advanced automotive technologies are focused on feedback, measurements of how the vehicle is reacting, NSX uniquely applies additional technology to focus on accurately responding to driver input through immediate, precise application of torque at each wheel at any moment. Using cutting edge computer-aided engineering (CAE) optimization software, engineers created a double-wishbone, double lower control arm front suspension that decouples the twin-motor unit (TMU) torque from the driver’s experience at the steering wheel, providing timeless sports car steering communication to the driver with a new experience of on rails handling provided by the precise torque vectoring of the TMU. Variable gear ratio steering is applied to further enhance the confident, race-ready driving dynamics of the all-new NSX. 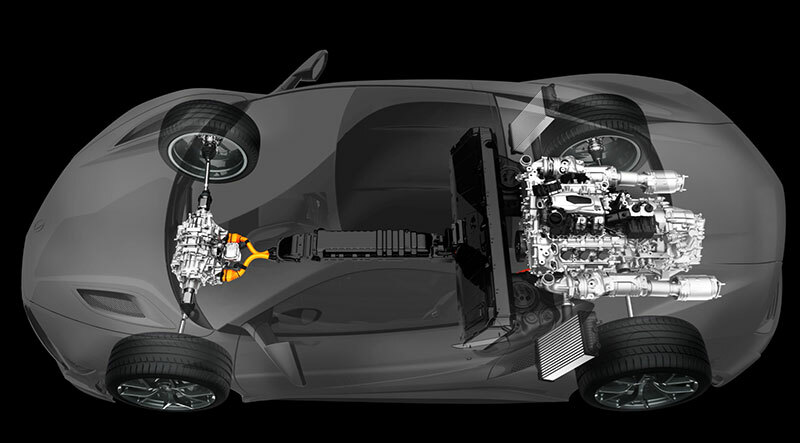 As announced at the 2015 North American International Auto Show, the new NSX will utilize an all-new power unit from a clean sheet design. At its heart is an all-new longitudinally mounted twin-turbo V6 engine that is mated to an all-new, Acura-developed 9-speed DCT with an electric motor that applies its torque directly to the crankshaft for higher output with immediate power delivery to the rear wheels. The new engine has a displacement of 3.5-liters and utilizes pinnacle racing technology, applying both direct and port injection to its design. The 75-degree V-angle and dry sump design optimizes engine rigidity and further supports the NSX’s Advanced Sports Package by allowing the engine and components to be lowered in the chassis to the maximum extent, resulting in the lowest center of gravity in its class. This also supports the advanced packaging of other engine components. The engine’s dry sump design also helps maximize vehicle performance in high lateral-G conditions. The rear direct-drive electric motor applies its torque directly to the crankshaft. The 9-speed DCT’s main, counter, secondary and output shaft design maximizes the advanced sports package through a configuration that lowers weight and helps to center the mass nearer the driver.